The idea of creating the AEC occurred at a JEDEC meeting in the summer of 1992. Gerald Servais (Delco Electronics - General Motors) met Jerry Jennings (Chrysler) and the resulting conversation included some of the mutual difficulties being experienced in the area of electronic part qualification. The automotive business segment was becoming a smaller percentage of the electronic parts market and, as such, was not receiving the supplier attention once enjoyed. The idea of common qualification specifications was mentioned as a possible way to improve this situation. At a subsequent JEDEC meeting, Mr. Servais discussed this possible cooperation with Robert Knoell (Ford). These initial discussions indicated the concept was probably feasible. Mr. Knoell discussed this idea with his boss Earl Fischer and a meeting was set up at Delco Electronics in January 1993. At this meeting, the various qualification approaches used by each company were discussed. It was decided that the idea of common qualification specifications was viable and work began on Q100 (Stress Test Qualification for Integrated Circuits) shortly thereafter. During the development of Q100, primary IC suppliers had an opportunity to comment on the document. The initial release of CDF-AEC Q100 (now shortened to AEC Q100) was presented to all of our IC suppliers at a meeting in Denver on June 1994. This document represented the preferred qualification document for Chrysler, Delco Electronics, and Ford. It encouraged the exchange of qualification data and stated that if a part was qualified to this document it was qualified for all three companies. This document did not involve part-pricing issues or prevent the three companies from using other qualification requirements for special conditions. activities, the AEC hosts an annual Reliability Workshop. 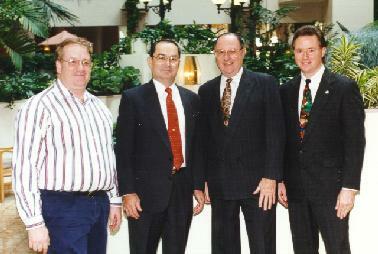 At the 1995 Workshop in Indianapolis, the following photo of the AEC founders was taken. Jerry Jennings (Chrysler), Robert Knoell (Ford).